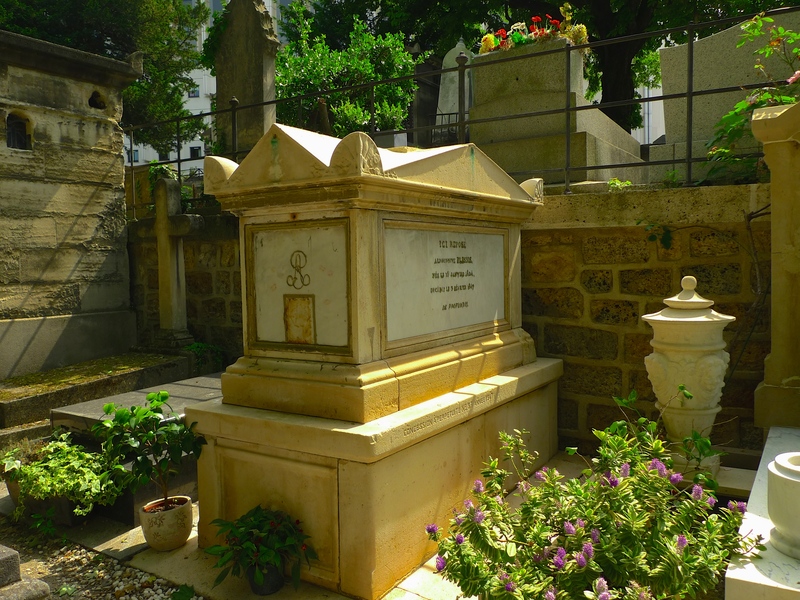 OPENED IN JANUARY 1825 as la Cimetière des Grandes Carrières (Cemetery of the Large Quarries), Montmartre cemetery was built in the hollow of an abandoned gypsum quarry previously used during the French Revolution as a mass grave. 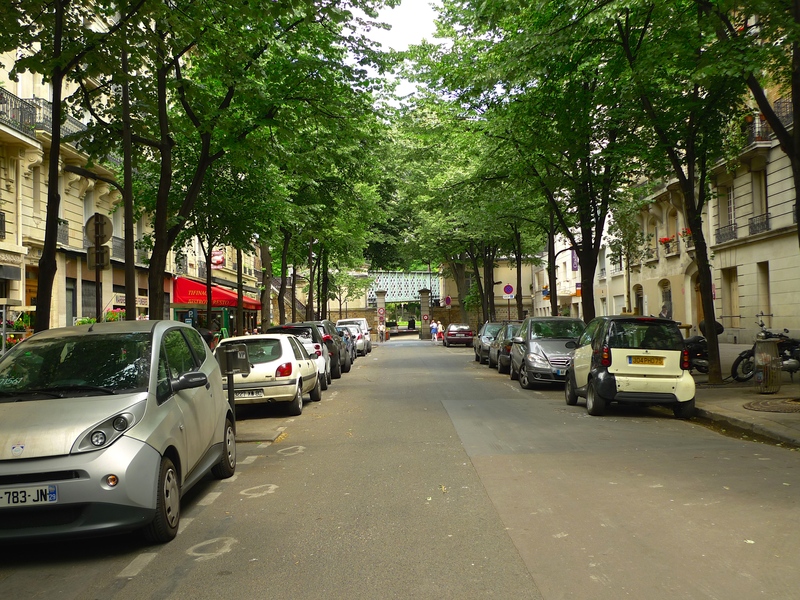 Located near the beginning of Rue Caulaincourt in Place de Clichy its sole entrance was constructed on Avenue Rachel under Rue Caulaincourt. Today, her body lies entombed in the cemetery’s 15th Division. 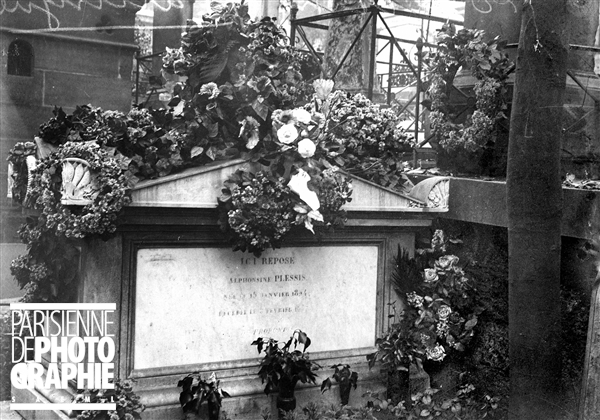 Few flowers adorn the tomb and even the picture once attached to the front of it has gone. It seems that she has been abandoned. Many will know her as Marguerite Gautier, the main character in La Dame aux Camélias by Alexandre Dumas the younger, or as Violetta Valéry, the leading soprano character in Guiseppi Verdi’s opera La Traviata but few will remember her for who she really was, Alphonsine Plessis, who died from tuberculosis at the age of twenty-three. Alphonsine Rose Plessis was born on 15th January 1824 at Nonant-le-Pin in Normandy. She was the daughter of Marin Plessis, an alcoholic who offered her to men from the age of twelve. At the age of fifteen she moved to Paris where she found work in a dress shop and by the time she was sixteen she had become aware that prominent men were willing to give her money in exchange for her company in both private and social settings. One of her suitors, Agénor, son of Duc de Guiche, took care of her education and turned her into a well-mannered lady. By now she preferred to be called Marie and she also added the faux noble “Du” to her name making her Marie Duplessis. By the age of twenty, Alphonsine Plessis or Marie Duplessis as she now preferred, had reached the height of the Parisian demi-monde. She was taken up by the elderly and very wealthy Comte de Stackelberg, a former Russian ambassador to Vienna. He kept her in high style, paying her bills, importing her carriage horses from England, and providing boxes in the best theatres in Paris. She was briefly married to one of her lovers, the French nobleman, Count Édouard de Perregaux, as a result of which she became the Comtesse de Perregaux. Her apartment on the elegant boulevard de Madeleine was filled with 18th-century furniture, paintings, silks and her modest collection of 200 books. Here, many of the brilliant minds of France gathered at her dinner parties, including Honoré de Balzac, Theophile Gautier, and Alexandre Dumas, fils. 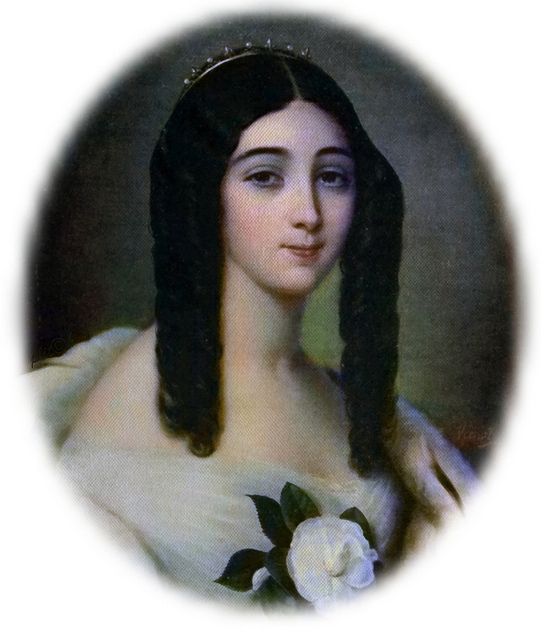 For almost a year, between September 1844 and August 1845, Alphonsine was the mistress of Alexandre Dumas, fils and then, towards the end of her life, she is believed to have become the mistress of the pianist and composer Franz Liszt, who reportedly wished to live with her. 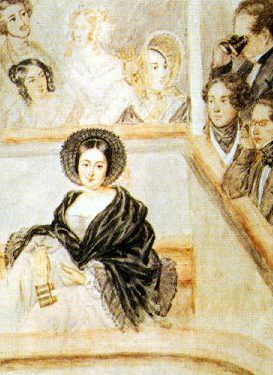 Alexandre Dumas, fils, was so enamoured of Alphonsine that he based his romantic novel, La Dame aux Camélias, on her. The novel appeared within a year of her death. In the book, Dumas became ‘Armand Duval’ and Alphonsine ‘Marguerite Gautier’. 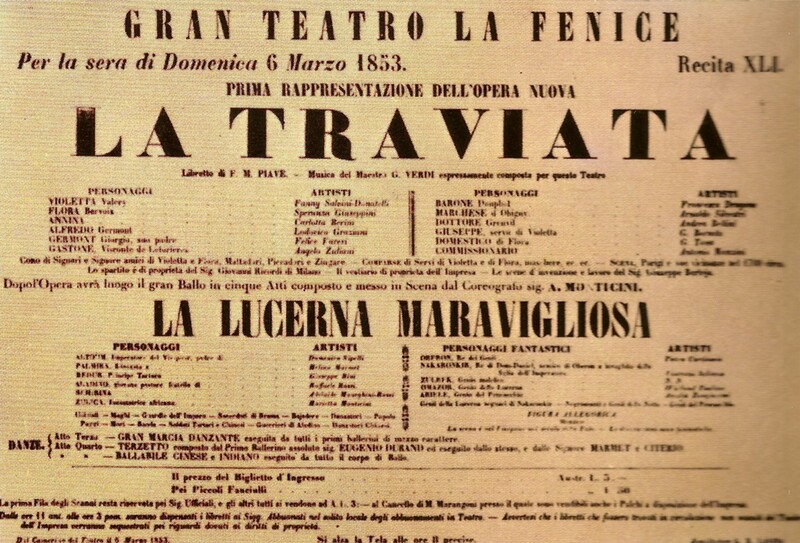 Dumas also adapted his story as a stage play, which in turn inspired Verdi’s opera La Traviata. In both Alexandre Dumas’ book and in Giuseppe Verdi’s opera the heroine’s death is described as an unending agony during which she is abandoned by everyone and can only regret what might have been. In real life, Alphonsine died from what is now called tuberculosis but was then called consumption, a disease that in the nineteenth century accounted for one in four deaths. She was aged twenty-three. Within a few weeks of her death her belongings were auctioned off to pay her enormous debts. Despite her appalling start in life, Alphonsine aspired to make her way in ‘society’. She became one of the nineteenth century’s grandes horizontales, courtesans who were able to maintain lavish lifestyles and who influenced the dress and tastes of cultured women while inspiring other pretty but poor young women with high ambitions. She was a popular courtesan with a catalogue of lovers and was not shy about taking advantage of their wealth and position to enhance her own status. She hosted a salon where politicians, writers, and artists gathered for stimulating conversation, she rode in the fashionable Bois de Boulogne, she attended opera performances and had her portrait painted. But, despite her apparent success, just like Marguerite Gautier in La Dame aux Camélias and Violetta in La Traviata, Alphonsine died abandoned, regretting what might have been. I’ve been fascinated by Alphonsine Plessis for a very long time. My first reading of Alexandre Dumas’ La Dame aux Camélias captivated me and Verdi’s La Traviata can reduce me to tears in the blink of an eye. Both of course are fictions inspired by Alphonsine Plessis but both I think capture the essence of this ultimately tragic young woman. 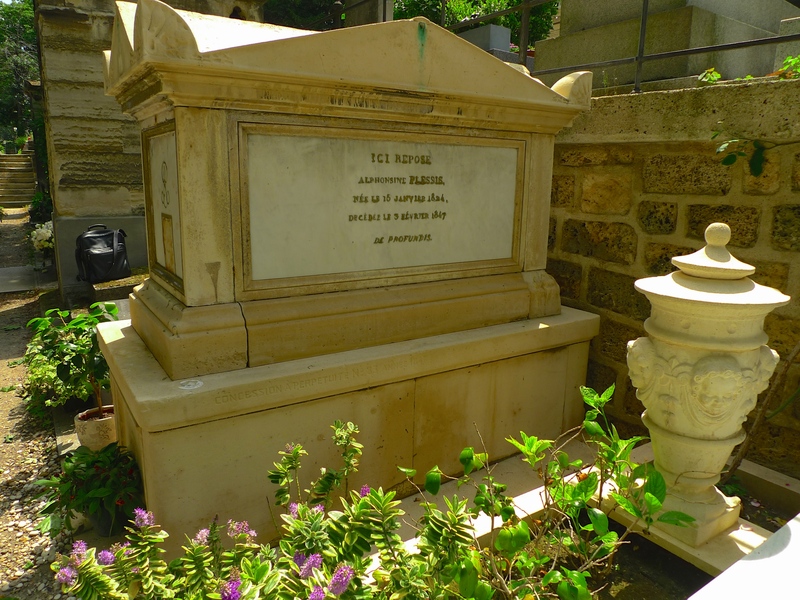 Placing microphones around the foot of Alphonsine’s tomb I recorded the ambient sounds on a sunny summer afternoon. I then added the sounds of the ‘Fantasia sur La Traviata’ composed by Pierre Agricol Genin and played by two exceptional musicians, Barbara Hill on flute and Laurie Randolph on guitar. For those familiar with La Traviata, this music depicts the life and death of Violetta, and by extension, of Alphonsine Plessis. The subdued ambient sounds provide both a contemporary context and echoes of the past, they are after all the sounds that Alphonsine hears and has heard every day lying in this place. My especial thanks to Barbara Hill for permission to use this recording of ‘Fantasia sur La Traviata’. Loved this post. Alphonsine’s life story reminded me of the fictional one of Zola’s Nana – another of the grandes horizontales, I suppose. The soundscape with the music lends a beautiful touch. Thank you, Susanna. I’m pleased you liked this piece. Yes, the comparison with Nana is very appropriate. Although Zola couldn’t have actually known Alphonsine, he was born I think shortly before she died, I’m sure he would have known of her – and of some of the other grandes horizontales too I shouldn’t wonder. 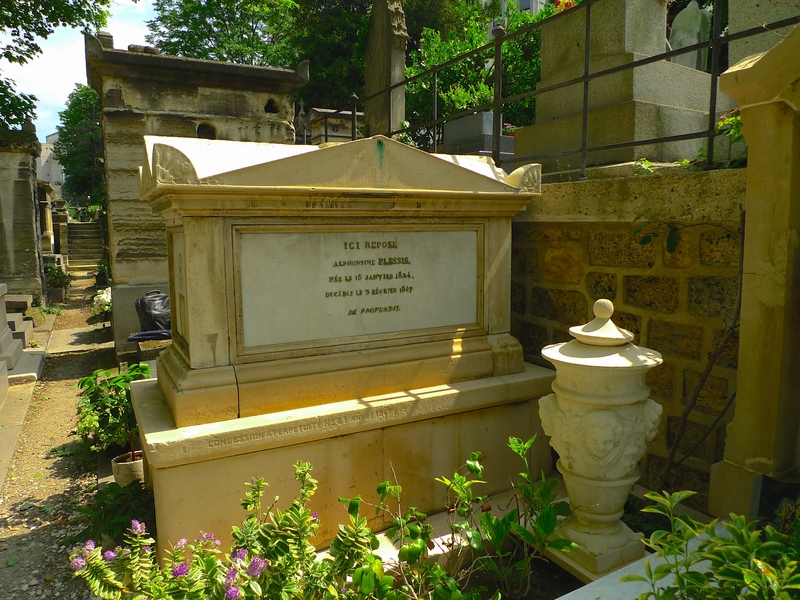 I had the ‘Fantasia sur la Traviata’ in mind as I stood by Alphonsine’s tomb. I think the music captures her story perfectly. What a short and sad life Alphonsine/Marie lived! Although I suppose some may have envied the caliber of lovers and “patrons” she attracted, I can’t imagine that the furniture, silks and imported carriages could have compensated for the profound loneliness of a courtesan. (Imagine being constantly chased by men and almost universally reviled by women!) But your gorgeous and creative recording really was the icing on this cupcake of a post, Des. It’s so evocative to hear the birds and the lonely footsteps against the backdrop of such sublime music. Thank you for starting my day with something of such sublime beauty. Thank you, Heather. Helping you to start your day is a responsibility one could never take lightly so I’m pleased I hit the spot this time. I can’t really explain why I have such a fascination for Alphonisne, although the book and the opera must have something to do with it. I’m not really a ‘graveyard tourist’ but I do find myself returning to her tomb from time to time, perhaps just to make sure she’s ok I suppose. I was quite upset to discover that the picture has gone from the front of her tomb, it was there the last time I went. Maybe someone has an even greater fascination for Alphonisine than I do and decided to take it as a souvenir. Who knows? *Any* day that starts with one of your posts is a good day, Des. 😉 And I think it’s sweet that you return to Alphonsine’s tomb from time to time, “just to make sure she’s OK.” It’s marvelous that — some 150 years after her death — she is still fascinating and alluring. Perhaps she did achieve a sort of immortality, in a sense? Or at least she’ll come a bit closer, with your marvelous blog post.